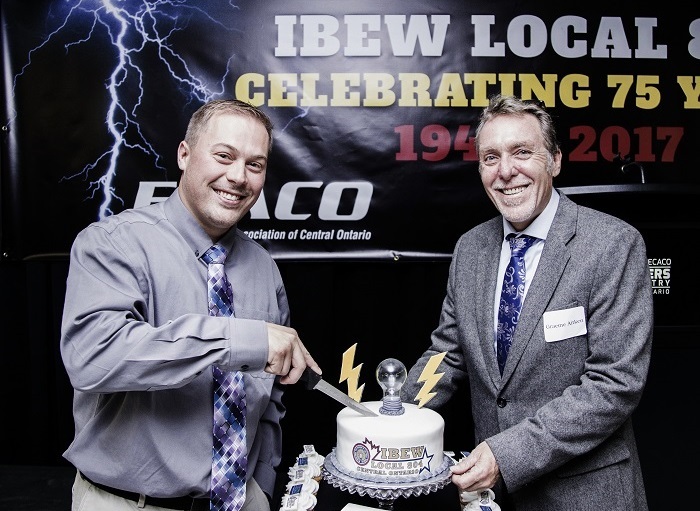 - Terry Moore, VP Electrical of Trade Mark Industrial Inc.
As of April 8, 2017, IBEW Local 804 is celebrating 75 years of safe, reliable electrical services in the Kitchener-Waterloo-Cambridge area. Close to 200 members and clients attended anniversary celebration at their new hall on October 25. Local 804’s Business Manager Mark Watson cuts the cake at the 75th Anniversary celebration with the help of Eptcon’s Manager of Labour Relations and Contracts, Graeme Aitken. 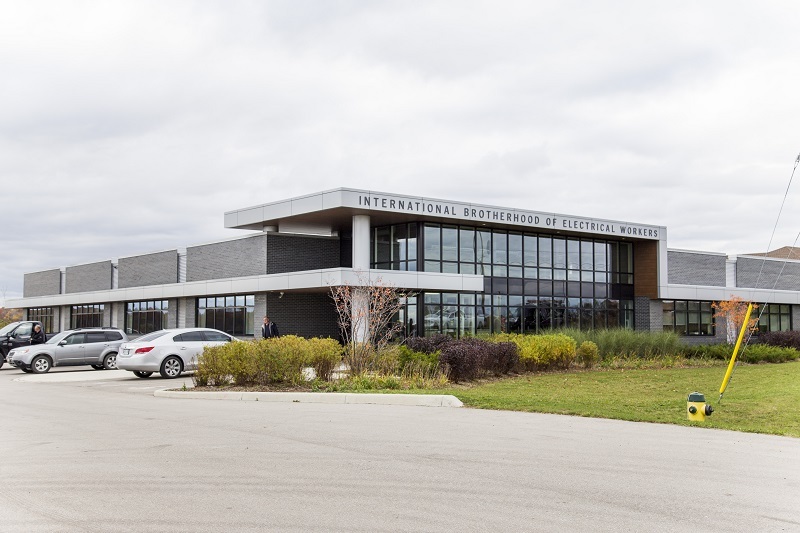 IBEW Local 804 was chartered in 1942, and since then it has been involved with almost every major construction project in the Kitchener-Waterloo-Guelph area. Watson can cite an impressive list of projects his local has been involved with. “Our members wired three local universities – Waterloo, Guelph, Wilfrid Laurier, and Conestoga College. We did the electrical for the very first full-scale nuclear generating station in Canada at Douglas Point, and the Bruce Nuclear Generating Station. Now over 1,300 members strong, Local 804 moved to a new facility in 2015 that boasts an expanded training facility. IBEW Local 804 has an ongoing partnership with Trade Mark Industrial Inc, an Electrical Contractors Association of Central Ontario (ECACO) contractor. Providing commercial, municipal, and provincial projects in the area, Trade Mark Industrial Inc. has an enviable list of clients. These include Toyota, Canada’s Wonderland, the University of Waterloo, Wilfrid Laurier University, Linamar, Safety Kleen, and the Chatham-Kent Public Utilities Commission/Entegrus Group — just to name a few. Terry Moore, VP Electrical of Trade Mark Industrial Inc., with Patty Demonte (left) and Michelle Esposito (right) of IBEW CCO tour the new training facility. “There have been times when the IBEW has helped us do the impossible, and do it on schedule. The IBEW always delivers,” says Moore. Trade Mark Industrial’s relationship with the IBEW extends back to its founding in 1998. “We voluntarily signed the agreement with the IBEW,” says Moore, who has been with Trade Mark since 2000. “We believe in the union. We all come from union backgrounds – in fact I am a member of IBEW 804 myself. IBEW Local 804 is also very active in local charity work, particularly for Habitat for Humanity. The members have wired over 60 homes for low income families to date. Doug Richards, retired IBEW 804 electrician and HabitatWR volunteer, accepts a plaque from Build Manager of HabitatWR, Darrell Bauman. 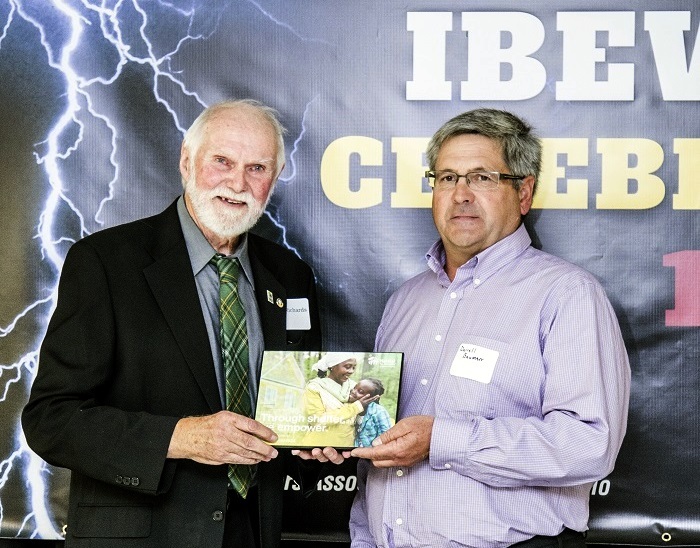 “For the past 12 years, IBEW has been partnering with Habitat for Humanity Waterloo Region through significant participation as volunteers,” said Darrell Bauman, Build Manager for Habitat for Humanity Waterloo Region. The younger members of Local 804 are active in support of the Food Bank. The Next Gen committee holds benefit events and does additional food drives every year. Looking to hire a contractor click here. 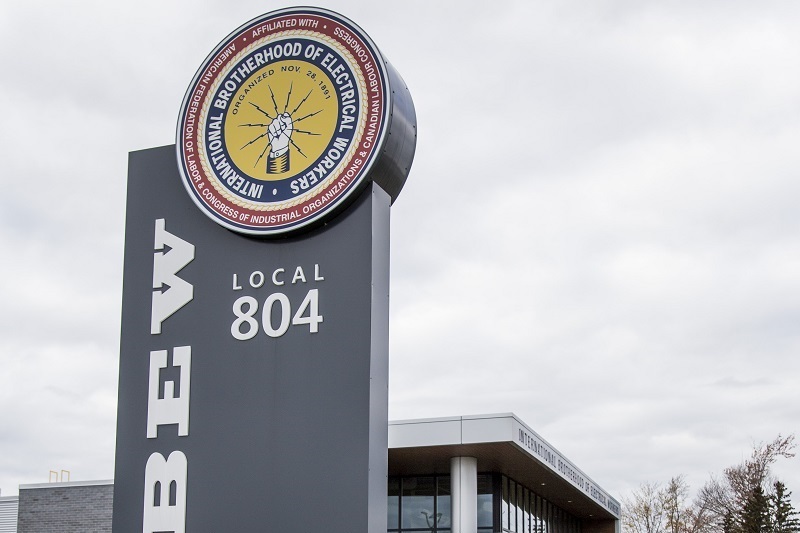 Learn more about IBEW click here.